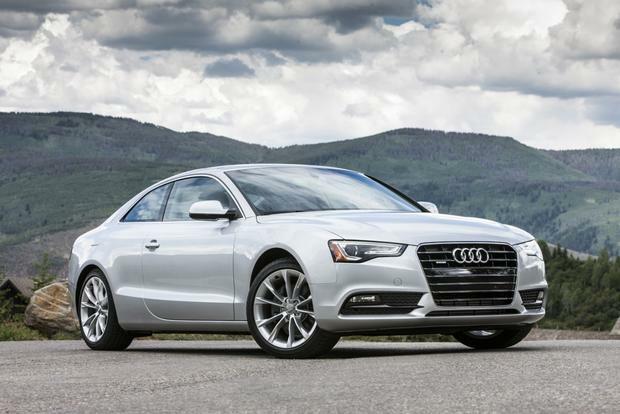 The redesigned 2018 Audi A5 should make luxury car shopping much easier. Check out these stats on why the A5 might be a perfect fit for you. The all-new 2018 Audi A5 adds fresh and exciting choices to the world of premium compact coupes and convertibles. The Audi RS5 Sportback is here -- and I love it. 2015 Lexus RC vs. 2015 Audi A5: Which Is Better? We're comparing the Audi A5 and the new Lexus RC for drivers interested in a sporty new luxury car. If looks alone could determine a car's appeal, the 2014 Audi A5 would be the only luxury coupe or convertible that mattered. Although the A5 is essentially just a 2-door version of the A4 sedan, its sophisticated styling suggests far greater exclusivity. Avoid this Audi if you don't want valets to display your wheels out front. You also may want to avoid the A5 if you expect serious speed in your luxury ride. Don't get us wrong, the mandatory 2.0T turbocharged inline 4-cylinder engine is a fine piece of engineering, but 220 horsepower isn't even that much for a family sedan these days. In the rarefied realm of luxury 2-doors, most motors offer considerably more muscle. Of course, Audi also sells the performance-oriented S5 (reviewed separately) with its stout supercharged V6. But bring money, because the S5 doesn't come cheap. So it's clear that the A5 isn't going to win many stoplight races. But we also know that plenty of shoppers in this segment care more about style and luxury than all-out performance -- and if that sounds like you, there's a pretty good chance you'll fall in love with Audi's 2-door stunner. The A5 gets a slight bump up to 220 hp, and the Drive Select system is now part of the Sport package. Also, Bluetooth and iPod connectivity is newly standard on all A5s. 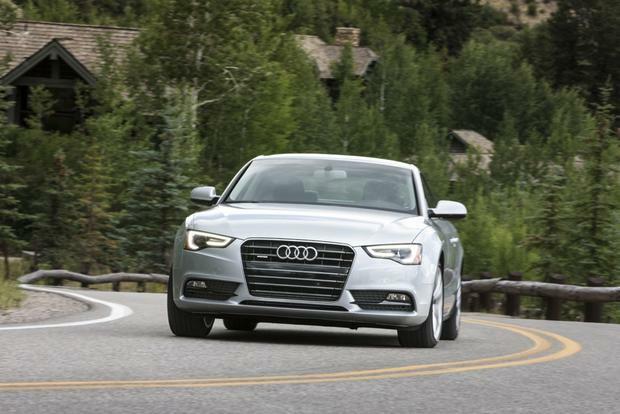 The A5 is powered by a turbocharged 2.0-liter inline 4-cylinder rated at 220 hp and 258 lb-ft of torque. The coupe gets standard Quattro all-wheel drive and either a 6-speed manual or an 8-speed automatic, while the Cabriolet starts with front-wheel drive and a CVT, providing Quattro and the 8-speed automatic as a package-deal option. According to the Environmental Protection Agency, fuel economy for the coupe is 22 miles per gallon city/32 mpg hwy with the manual, while the automatic yields 20 mpg city/29 mpg hwy. The Cabriolet is rated at 24 mpg city/32 mpg hwy with the CVT and 20 mpg city/29 mpg hwy with the 8-speed automatic. The 2014 Audi A5 coupe and convertible (Cabriolet) are offered in three trim levels -- Premium, Premium Plus and Prestige. The Premium ($39,895) comes with 18-inch alloy wheels, LED daytime running lights, fog lights, a panoramic sunroof (coupe only), a power-operated vinyl roof (Cabriolet only), leather upholstery, single-zone automatic climate control, power front seats with driver lumbar adjustment, a tilt-telescopic steering wheel, Bluetooth and iPod integration, the Multi-Media Interface system with a dash-mounted control knob and a 10-speaker audio system with an auxiliary input, SD card reader and satellite radio. The Premium Plus ($42,995) adds xenon headlamps, LED taillights, auto-dimming mirrors, driver memory functions and tri-zone automatic climate control, meaning the rear passengers get their own separate climate controls (a very unusual feature in a coupe). The Prestige ($49,095) goes all-out with adaptive xenon headlamps, sporty S-line exterior trim, a blind spot warning system, keyless entry with push-button ignition, MMI Plus with navigation and a console-mounted joystick knob and a 14-speaker, 505-watt Bang & Olufsen audio system. The 2014 A5 also offers the Audi connect system, which turns the car into a mobile Wi-Fi hotspot and also includes various Google applications, including Google Earth for navigation functions. Many of the higher trims' features are available on lower trims as options. Among the other available niceties, depending on the trim level, are 19-in wheels, heated seats (standard on Cabriolet), adaptive cruise control, a Black Optic trim package and a comprehensive Sport package (including sport front seats, a sport-tuned suspension, shift paddles for automatic-transmission cars and the Drive Select system, which gives the driver electronic adjustments for steering effort, automatic transmission programming and throttle response). 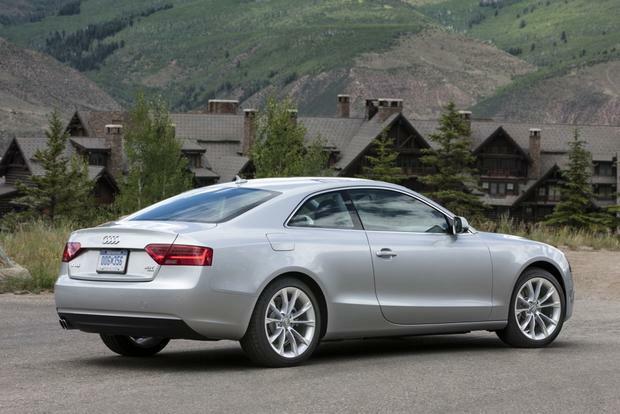 The 2014 Audi A5 comes with standard stability control and 4-wheel anti-lock disc brakes. The coupe gets six airbags (front, front side, full-length side-curtain), while the Cabriolet gets four airbags (front, front side). The A5 has not been crash tested in the U.S. The A5's driving position is decidedly low-slung, emphasizing the car's sleek, intimate character. But the standard front seats are unexpectedly plain, offering little in the way of lateral support. We expect more in a European sport/luxury coupe. The Sport package's upgraded front seats are much improved, providing ample bolstering along with excellent long-distance comfort; however, only Premium Plus and Prestige models are eligible for this upgrade. Unlike the A4, the door-mounted armrests in the A5 curve back plenty far to support the elbows of long-legged drivers. Equipped with front-wheel drive and the CVT, the A5 Cabriolet may be the least engaging premium convertible on the market. The transmission is neither responsive nor particularly refined, and it seems to sap some of the engine's power. 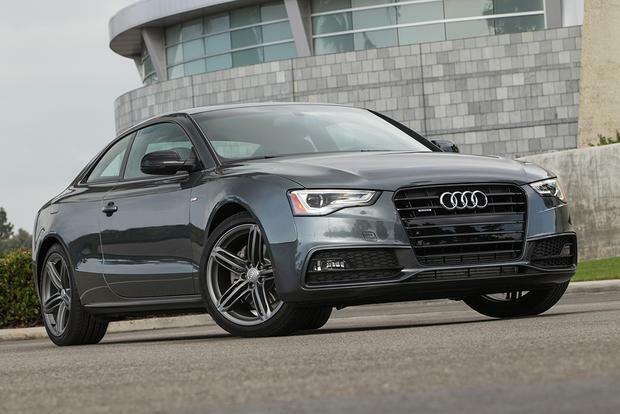 Fortunately, Quattro brings a superior 8-speed automatic and an available 6-speed manual in the coupe. But no matter which configuration you choose, there's no getting around the engine's modest output. The A5 may look like it's got a nose for speed, but the turbo 4-cylinder simply runs out of breath at higher velocities. Handling is good in standard form and excellent with the Sport package's sport-tuned suspension, while the ride remains supple unless you get the optional 19-in wheels, which we wouldn't advise. On the highway, the A5 feels invincible, tracking straight and true with nary a vibration at any speed. Road noise is less noticeable in the coupe, but the Cabriolet remains peaceful by soft-top standards. Overall, the A5 is a pleasure to drive; it's only the power deficit that holds it back. BMW 4 Series -- Keep an eye out for the new 4 Series, which is the renamed 3 Series with upgraded styling and features. It's the primary bogey on the A5's radar. Mercedes-Benz E-Class -- We're not talking about the familiar E-Class sedan here, but rather the more exclusive coupe and Cabriolet models, which are actually hybrids of C-Class and E-Class architecture. They're tuned more for comfort than the Audi, while no-nonsense V6 and V8 power makes them hard to resist. Ford Mustang GT -- Open to something different? How about a Mustang GT coupe or convertible? You can't beat the value, and the Mustang's 5.0-liter V8 is one of the best engines in the world. Used BMW M3 -- You could easily find a lightly used V8-powered 414-hp M3 for the price of a new A5. Just saying. We'd demand the style of the coupe and the performance of the Sport package, so our target would be a coupe in Premium Plus trim.